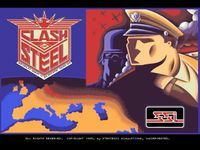 Clash of Steel is a grand strategy computer game released in 1993 by Strategic Simulations Inc. (SSI) for DOS. It covers the World War II in Europe on a grand strategic scale between 1939 and 1945. Three major powers are playable: Germany (Axis), the Allies and the Soviet Union. In the game each player in charge of his chosen major power and its land, air and naval forces. Each player also controls production and research of military equipment. This game contains a number of bugs that were fixed in the follow-up game, Clash of Steel: Future Edition. Buyers of the original version were given a discount when upgrading to Future Edition. Source: Wikipedia, "Clash of steel", available under the CC-BY-SA License.